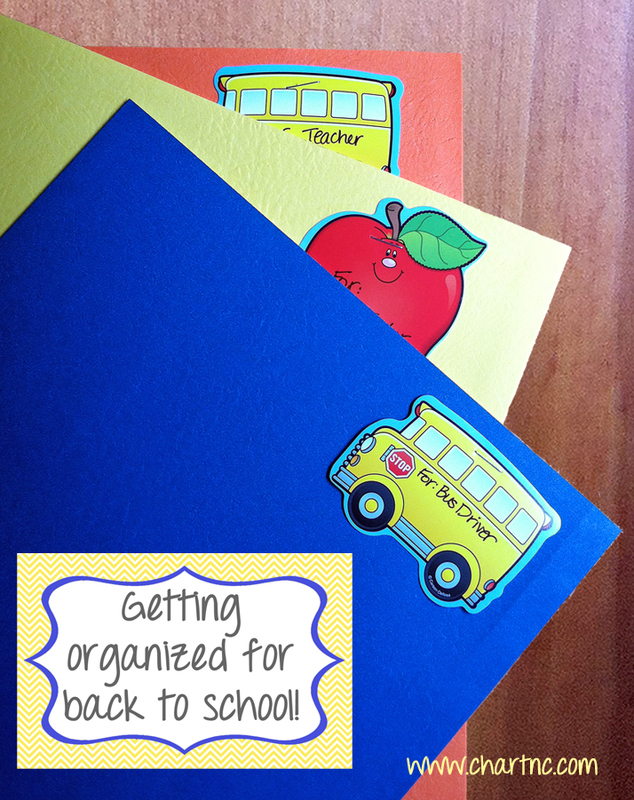 I don't know about you, but getting ready for back-to-school is a big project for our family. With our son entering Kindergarten this year, I have an even bigger back-to-school to do list than ever. The past few days have been spent preparing notes for my son's new teacher and assembling folders to share with key staff at the school. What's in the folders, you ask? There is the IEP at a Glance, a Student Profile (with a really cute photo of our little Kindergartner! ), a copy of his behavior plan, and the must-read 10 Things Your Student with Autism Wishes You Knew by Ellen Notbohm. The teacher's packet also includes some sensory tips from our OT and a list of tips for working with our special learner. Because he is very much a twice exceptional student, I will be sharing my copy of a booklet called The Twice-Exceptional Child with Asperger Syndrome from the 2e Newsletter. Of course I also made sure that the teacher has a copy of the current IEP and Transition to Kindergarten plan, but those aren't in all of the packets. 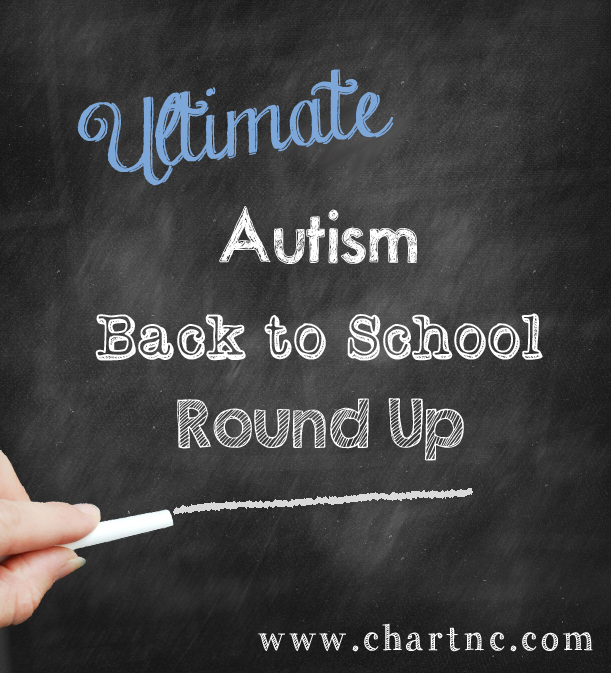 The Really Big List of Back to School Tips for Kids with ASD by Snagglebox: When they say really big, they mean it! This list has 35 highly practical tips on preparing your child for the transition back to school. There are some very helpful ideas that would be easy to overlook, such as practicing using a locker (so important for rising middle school students!) and building up their coping reserves so they are able to handle the increased demands of school. Strategies to Ease Your Child into a New School Year by Eileen Riley-Hall on Special-Ism: The mother of two daughters on the spectrum and an educator, the author provides a veteran's perspective on how to ease the stress of school starting again. I particularly loved the tips on building a positive relationship with your child's teacher - there is nothing like a solid partnership with your child's school to help get the school year off to a great start. 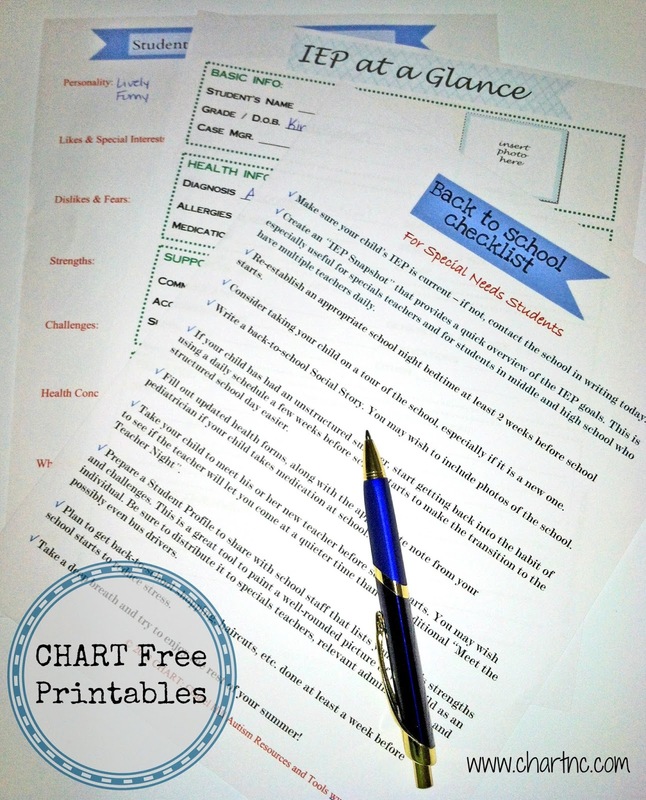 CHART Back to School Printables: Find all of our free back to school printables on this page: the Back to School Checklist for Special Needs Students, the Student Profile, and the IEP at a Glance. They will definitely help you to get organized and share critical information about your child with his school. Please feel free to share! Choosing a School for Children on the Autism Spectrum by Kristina Chew on Thinking Person's Guide to Autism: This article discusses many of the educational options (excluding homeschool) for children with ASD. Chew talks about the process of researching schools for her own son on the spectrum, and gives advice about what to look for when evaluating prospective schools. This is a good primer for anyone considering placements beyond your neighborhood public school. Back to School by Chrissy Kelly of Life with Greyson + Parker: If you click only one link in this entire post, please make it this one. Chrissy Kelly is the mom of two boys with autism and a talented photographer (her blog is worth looking at just for the glowing photos of her sons). She wrote an incredibly moving story about a boy that her classmates tormented when she was a child, her deep regret that she did nothing to stop it at the time, and a mother's plea that other children treat her boys with kindness now. The post includes a terrific letter written to her son's classmates telling them how to be a friend to her non-verbal child. While you are on the blog, do yourself a favor and read the stories about Frank, the Fresno garbage collector with a heart of gold. It will restore your faith in the goodness of people. A Hair-Dryer Kid in a Toaster-Brained World on MOM - Not Otherwise Specified: Have you ever wondered how to explain autism to a classroom full of kids? Wonder no more, because this story has the most perfect analogy ever. This mom prepared an incredible presentation to help her son's classmates come to better accept and understand her child. She explained that his brain is wired differently than theirs, and the kids really got it. Bud's classmates started shouting out all of the really amazing things that he can do thanks to his hair-dyer brain, while also noticing the ways that he is just like them. His classmates also asked very smart questions, and along the way learned so much more about their friend. A classic. For Adam (aka Letter to Chase) by Glennon Melton of Momastery: This one is perfect to share with your typical kids, classmates, students, pretty much everyone. It is a moving letter Glennon wrote to her son Chase about a boy named Adam that was bullied in her school. She asks her son to be a better person and to show compassion, stand up for the teased, the lonely, the different. She defines compassion in terms that her 3rd grade son will understand and then tells him, "We send you to school to practice being brave and kind." Because sometimes it does take bravery to be kind to the kids in school who are different, and don't we all hope that some child will be that brave if our children are the ones who need a friend? A Special Sparkle: Have you found this blog yet? It is a wonderful collaboration by a number of special educators and right now they are featuring a great series of back to school posts. The posts are particularly useful for teachers - there are tons of ideas for structuring a classroom, using visuals, and of course lots of free printables. It's definitely worth checking out, whether you are a parent, therapist, or teacher. Do you have any other favorite back to school resources? Be sure to leave a comment and let us know!